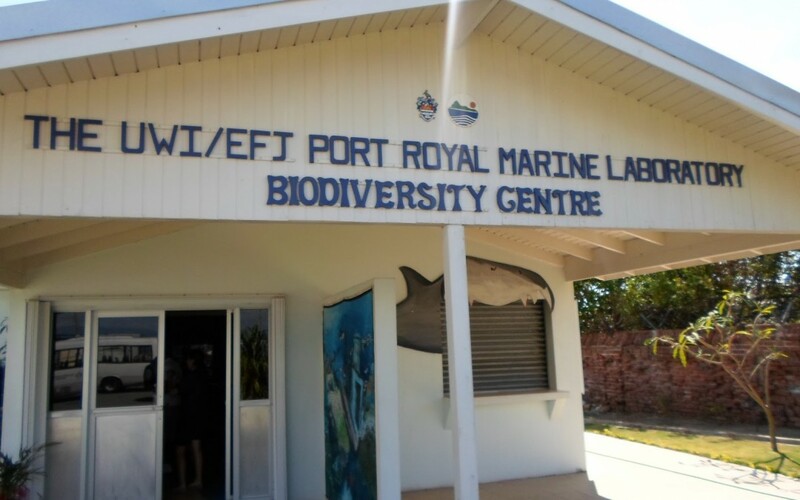 As part of an environmental awareness project Youth Opportunities Unlimited is running in partnership with the Environmental Foundation of Jamaica, about 30 Rockfort residents visited the University of West Indies Marine Biology Laboratory in Port Royal on January 19.
b. lifestyle changes to mitigate losses (in particular flooding). 2) Collaborate with disaster resource agencies and develop action plans. 3) Increase disaster risk reduction practices and coping strategies, through Youth leadership. 4) Introduce the use of low income risk transfer insurance as a self-sustainable mechanism. Jamaica’s harbour is the seventh largest in the world. The area around the UWI Marine Biology Lab is an area protected by law, as it is home to many endangered species like sea horses, sea turtles, sting rays, pelicans, grouper and mutton snappers. There are four types of mangroves: red, black, white and button. Many species use the mangrove roots as shelter, like crabs, sponges, oysters, rats, mongoose, snails and fish, and the trees act as a buffer from the elements, as well as a filter for carbon dioxide. However, their existence is threatened by hurricanes, invasive species and human interference. Foreign ships are not allowed to be driven into the harbour as it can get as shallow as three feet. So Jamaican ships meet the foreign ships and bring people ashore in small boats. After the lecture, persons set out in a boat with Captain Terrence for a tour of the mangrove forest. It was a calm, grey, overcast day, perfect for a boat ride. The boat slowly made its way past fishermen into the mangrove forest, which is spectacular and peaceful. We glided slowly under the green canopy, spotting all of the creatures mentioned in the lecture. We got to hold an oyster and sponge and saw a mongoose and many species of birds. It is mating season, so we also heard the cries of baby birds taking their first steps. We encountered a couple of fishermen diving for oysters and conch as well. As we cruised, Chevelle narrated what we were seeing and the participants had many questions and observations. We heard the alarming fact that 21 gullies empty their refuse into Kingston’s harbour and we saw the effects of this: the red mangroves at the fringes are dying. We also saw plenty of garbage, from tires to shoes to a laundry hamper to hundreds of plastic bottles. Another instance of “human interference” we witness were bare patches on the ocean floor. These empty spaces were where fishermen had used dynamite to catch fish. We then made our way back and toured the Lab, where you can see jellyfish, crustaceans and several types of fish. This tour was eye-opening: garbage is everywhere in Kingston, including the beautiful harbour, but this trip allows one to see the effects on the many species vulnerable to it. The Rockfort residents were engaged and surely this trip will have an impact on their mindset in their attitude towards the environment.